Where do you go and what do you do when you want to become a climate change activist? When you start watching a lot of documentaries, understanding what is happening in the world, asking yourself about your role in society, and wondering how we ended up there, then it’s time to take a step towards a different lifestyle. It doesn’t have to be as radical as moving to the Caribbean, though that’s the choice I made. Climate change…what a vast subject. It feels like each and every action that we take in our comfortable western lives leads to this. We are indoctrinated with the belief that we need to always buy more, so we always produce more and then we just always throw away more. This remark from a friend still resonates with me: “You’re throwing this away. But there is no Away!” We are taught to put things in waste bins and once our waste is in there, well, we stop thinking about it altogether. We are completely disconnected and nobody is held responsible for the waste we produce. We could also talk about the textile industry and the Fast Fashion; or about the agrochemical industry and the monopoly of seeds and chemical fertilizers and pesticides; or about nuclear waste disposal, rising CO2 levels in the atmosphere, privatization of water, mass tourism industry, overfishing, coral bleaching… The subjects are endless and the more you know, the harder it becomes to live a “normal” life. That’s when I decided I needed to take some reflection time and start to experience a different lifestyle. I did some research and then I learned about Richmond Vale Academy. Richmond Vale Academy, most commonly known as RVA, stands for a different approach in education and is what we call “Another Kind of School.” It is an educational institution with the aim to train activists from all over the world to fight global warming and global poverty where the need is greatest. To do this, people from all backgrounds and cultures come together in the beautiful country of Saint Vincent and the Grenadines, to make a difference and change the world, one person at a time. We live a collective life in an international environment, with teachers and participants from many different countries and with a multitude of different backgrounds, beliefs, cultures, skills, languages, and education. Life at Richmond Vale Academy is in many ways simple. About five to 10 people live permanently and groups of students start every three to four months, which means that there are constantly between 15 and 50 people living at the academy, depending on the number of students enrolled. We live at the end of the road in the second poorest nation in the Caribbean, very far from the consumerist society of shopping, restaurants, and bars. So we produce our own culture and entertainment, and a lot of creativity follows. Living at RVA means that we share everything and spend all our time together. Students are split into teams according to the program they are following and as the people come and go and the timelines overlap, we get to learn from each other. The students that have been here longer teach the new students how life is organized on campus and it creates a really strong sense of inclusion and belonging. The six-month climate compliance program, my program, is divided into different periods. We spend about a quarter of our time studying about the various issues leading to climate change, through research, reading articles and books, watching documentaries, informing ourselves, preparing presentations, teaching each other, and debating as much as possible. This is a very important part of our lives here at RVA, as it helps us better understand the actions we can take to really change the world. About half of our time is spent in the village, doing volunteer work. My team focused on building home gardens for locals in order to help them become more resilient and independent, and to give them the opportunity to attain food security and economic stability. This “Pass It On” model organic garden program is a good way of showing people that a lot is possible and that everybody can do it too. Other teams have worked on building biogas stations, some on education, beach cleanups, tree planting, etc. Many actions can be taken to have a positive impact on local lives. The remaining time is spent on different projects such as preparing workshops for visitors—about permaculture, about seeds, about plastic waste, etc. We also work on making booklets, videos, blogs, and newspaper articles to spread the word about the school and about the ways to help fight climate change. And of course we also spend a lot of time together, during cultural evenings, game nights, movie nights, hikes, field trips, and much more. Participating in one of RVA’s programs means being part of a team of two to 30 people from all over the world and that means adapting to very different ways of thinking, different ways of working. Some traditions or ways of expressing our feelings and emotions and passing on messages vary greatly from culture to culture. Something that you would normally say or do in your country might upset someone from a different culture and it can result in conflicts. A conflict can be challenging to deal with as it soon becomes a global/public matter in the small community. As amazing and beautiful as it is, living at RVA brings its fair share of challenges and can sometimes be overwhelming, but it is all well worth it. Living at RVA means giving up some of your usual comfort. For many of us, we have lived in a home with our family and then moved out to our own place like a flat or a house. Most of us had access to our own bathroom and a nice kitchen in which we could prepare whatever we fancied. Coming to RVA, you start by sharing a room, which most of us have not done for a very long time. That can create some difficulties in the beginning, as you get to share with a total stranger. This is a real challenge for some of us. But because we come here for a specific purpose we all work together to make it functional. Community life can be enjoyable and successful for all of us only if we all put in the amount of work required. For some, sweeping the floor of the main hall once a week sounds like a lot, while for others twice a day would be more appropriate. Sharing tasks and responsibilities is part of our everyday life and is not perceived by everyone in the same way. Every morning, we all take 45 minutes, before we start working, to clean a designated area. When everyone is dedicated and cleans, the whole dynamic is good and the atmosphere is very positive. But sometimes people get less involved and start to lose motivation; this drives the whole atmosphere down as people start questioning: “I am cleaning more than this and this person, I am not going to clean as much because it’s not fair.” The Health and Hygiene team that is in charge of organizing the cleaning really needs to come up with creative ideas to keep everybody active. We are very lucky to have cooks that prepare our lunch and dinner every day and an incredible Kitchen team that organizes the menus and the shopping list. We try to consume local and healthy food as much as possible. It can be hard to accommodate everybody’s taste and it can be very challenging keeping everyone happy. We have had to adapt the menus many times; some cultures are used to eating bread with every meal, while others are trying to reduce their consumption of carbs. Accommodating all the eating preferences is another big challenge; we have meat eaters, vegetarians, vegans, gluten-free, and a combination of all of the above. Let me tell you, the cooks and the kitchen team have to be very, very creative. Another challenge that people face when coming here is Reality. Most students come from rich countries and have always had access to the basic necessities. Most of us have always had food on the table, water coming out of the tap, and electricity to light up our lives in the evenings. Many of us have never had to witness poverty. Coming here, you realize that some people, your neighbors, don’t have access to these basic commodities that we are so accustomed to. This often brings a feeling of helplessness and some people have a difficult time overcoming this. But the important thing is that even though there is poverty, everyone has a roof over their heads. The sense of family and community is very strong in Saint Vincent and it is beautiful to see the mutual help between people. If a neighbor doesn’t have food on the table one day, people will happily share a portion of their meals to support them. If your focus is on what you are here to achieve, you can overcome this feeling of helplessness and accomplish a lot for these people to empower them to become more financially stable and make a big difference in their lives. That’s what we do as part of the climate change activist program, by building home gardens in the local communities to help people gain food and economic security. Spending six months at RVA was a way for me to define and explore possibilities for the future. I know that I don’t want to go back to a society that pushes me to be someone that I’m not. I don’t want to purchase dead things, wear make-up, and have a job that will benefit only a few. I want to change my lifestyle, live closer to the earth and nature, plant trees, and walk barefoot. 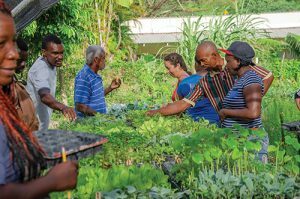 Being part of a team, learning about the issues of the world, working in the gardens at RVA and in the village, meeting the local community, creating relationships with very different people is a very enriching experience that everybody should have the chance to live. ← 1,400 People Every Day!